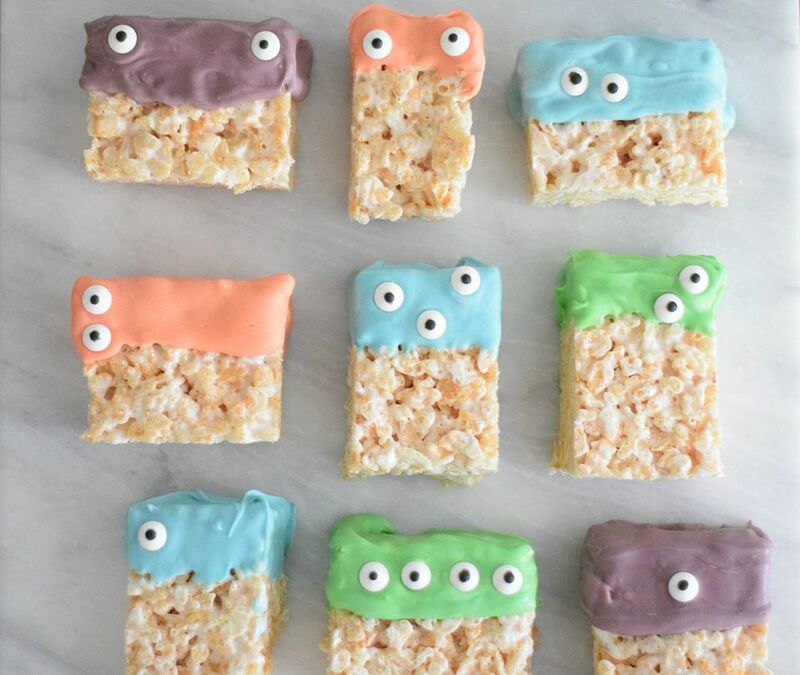 These creepy monster Rice Krispie treats are the perfect Halloween party snack. The recipe takes the classic cereal treat up a notch with cute candy eyes that are easy to make and look super impressive. Dip the Rice Krispie treats into white chocolate colored in different hues to make little monster heads and add edible candy eyes in different arrangements to create the creepy monster look. You can try out lots of different designs with the eyes. Why stop with two? Monsters can have as many as you like—make your treats look unique and creative! Edible candy eyes can be found in most craft stores in the cake and candy decorating section. You can also find them online. They can also be made from scratch from royal icing. It's much cheaper, but can be rather time-consuming. Grease a 9x13-inch baking pan with non-stick cooking spray. In a medium-sized saucepan that is large enough to also fit the marshmallows, melt the butter. Add the marshmallows, turn the heat to low, and stir until the marshmallows have completely melted. Don't leave the marshmallows unsupervised—they marshmallows will burn or brown very easily. Stir in the cereal two cups at a time until they are thoroughly combined. Press the Rice Krispies mixture into the greased baking pan. We recommend greasing your hands as well to prevent the mixture from sticking to fingers. Allow treats to cool and then cut into 12 rectangles. Put 1 cup of the colored candy melts into a mug. Microwave 30 seconds at a time until the candy has melted. Stir in the 1 to 2 teaspoons of oil until it is completely combined. Dip three of the rectangles into the candy, covering about 1/3 of each rectangle. Try dipping them both vertically and horizontally. Lay each rectangle onto the sheet of parchment paper. Arrange the candy eyes as you like onto the melted white chocolate. Experiment with different arrangements and different amounts of eyes. To make your own candy eyes, you can use regular and/or miniature white chocolate chips and melted semi-sweet or milk chocolate. Make a dot with the melted chocolate onto the flat side of the white chocolate chip and let dry. Then press the pointed side of the chip into the treat to secure. If you can't find colored candy melts, you can substitute with white chocolate and food coloring. Buy regular white chocolate chips and after they've melted, add in the oil, followed by the food coloring. Be sure to follow directions on the box to get the right color combinations and mix in the food coloring completely to prevent streaky color.